Detail: David Nathan. 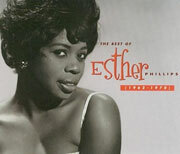 THE BEST OF ESTHER PHILLIPS. Edited by Melissa Totten. Los Angeles: Rhino Entertainment Company, 1997.